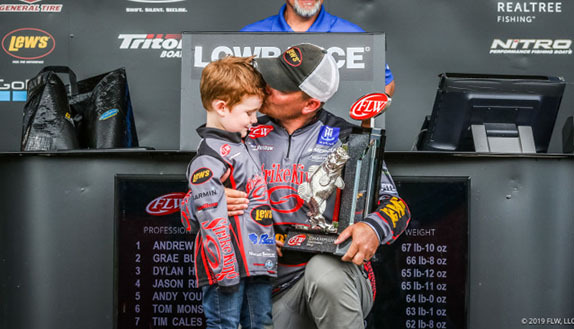 Ish Monroe used his trusted program of flipping and pitching heavy weights at shallow cover to notch a top-5 finish at the Toledo Bend Elite Series. It�s no secret that Ish Monroe would spend the rest of his days bass fishing with a flipping stick in his hand and a frog at the ready. 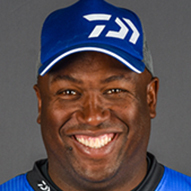 While he�s widely known as one of the top shallow-water anglers among touring pros, his tactics aren�t so much. 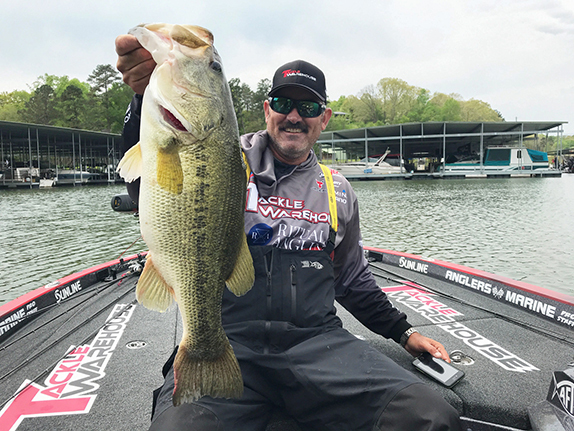 At Toledo Bend, he fished a �- and 1-ounce River2Sea Junkyard Jig designed by Tommy Biffle to run up the leaderboard. Chautauqua Lake, Monroe had success fishing behind competitors who had been pitching and flipping lighter sinkers. The lake was in the midst of a mid-summer algae bloom at the time and water clarity was an issue even around docks. �In dirty water it makes so much noise that it triggers fish into striking,� Monroe said. Every angler has hit the pilings on a dock or the cross bars or limbs on trees as well as the rocks on the bottom. What anglers need to understand, Monroe says, is that when fish are hungry, those collisions are akin to the dinner bell ringing for bass. �In clean water situations, when that heavy sinker hits bottom and kicks up muck or dirt, those fish can see that from a distance and can trigger fish into striking,� Monroe added. Once Monroe�s bait hits the water, he follows a strict checklist before he reels up and starts over. Monroe knows to use a hard-pressure hookset versus a snapping hookset. With a pressure hookset, by pulling hard, largemouth will clamp down on the bait harder eventually letting the sinker to slip through. �You peg them in the roof of their mouth every time,� Monroe added. He locks his drag down tight to ensure a solid hookset. Monroe favors a Missile Baits D-Bomb paired with a 5/0 River2Sea New Jack Flippin Hook and a minimum of a 1-ounce River2Sea Trash Bomb weight. He prefers the candy grass pattern when bluegill are present and uses bruiser flash as a back-up. Day in and day out, the latter color is his confidence bait. �If the D-Bomb isn�t working I�ll switch to the Missile Craw and be sure to match the hatch with both baits,� Monroe said. > 8� heavy-action Daiwa Steez AGS flipping rod, Daiwa Zillion HD casting reel (Monroe likes the 100-mm handle and 13 pounds of drag gives him confidence on hooksets), 65-pound Maxima Ultragreen braided line. 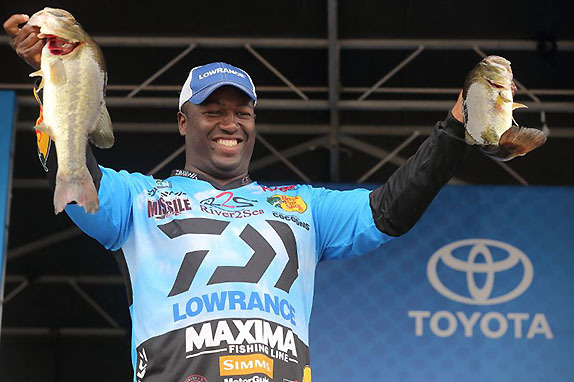 Larry Nixon and Kevin VanDam - "Nixon was stomping everybody when I was getting into it, and he was a worm fisherman. VanDam's confidence is incredible." Lake Amistad (TX) � "It's just phenomenal, incredible. 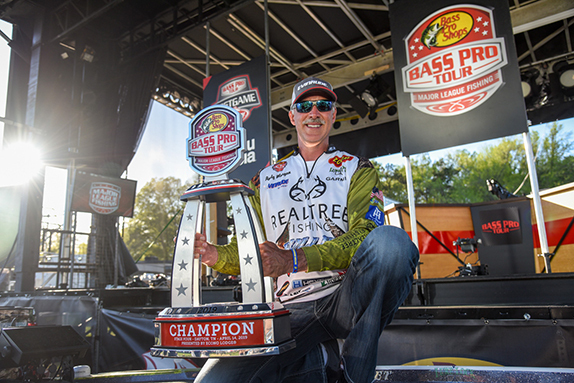 I caught 104 pounds in 4 days and got my first tour win there." Lake Hamilton (Ark.) - "It's crowded, it's small and it gets pounded too hard." Flipping mats - "Any bite could be a double-digit fish." Dad � "He taught me so much about life and how to be successful." "I'm always fishing. I like to fish for anything. Carp, bluegill, crappie � as long as I'm fishing I'm happy." "Because I love it. For me it's the purest thing in the world. I'd rather fish than do anything."